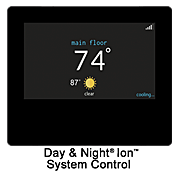 If customers are not yet using a programmable thermostat, suggest the Day & Night® Ion™ System Control to them. The Ion System Control makes it easy to turn down the temperature while everyone is at work/school (and no one is using the space) and warm the house up before the family arrives back home. A new Day & Night® Constant Comfort™ Deluxe 98 gas furnace could lead to substantial savings on heating bills, compared to an older 60 percent AFUE model. 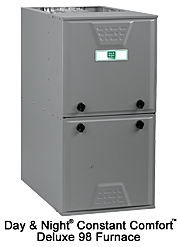 Day & Night® Heating & Cooling Products has an extensive line of high-efficiency furnaces to choose from. Help your customers make the right decision for their comfort needs as well as their budget. Then, make sure to schedule the furnace installation before Old Man Winter arrives.